For followers of the Canadian Opera Company Ensemble Studio, September is an exciting time. That's when we get to renew acquaintances with returning artists, and to meet new ones joining the Ensemble. This year is a particularly interesting one. As a long time follower of the Ensemble since its inception in the early 80's, I don't ever recall a season with four tenors! And back in the 80's the ensemble was larger, with something like 18 artists. We usually think of tenors as fairly rare in the music world, with the baritone voice being considered the more "natural" sound for men. But COC has had the great good fortunate to be tenor-rich the past three or four seasons. This year we have four excellent tenors and two sopranos and no mezzos - good thing there are two bass-baritones to hold down the fort for the lower voices! 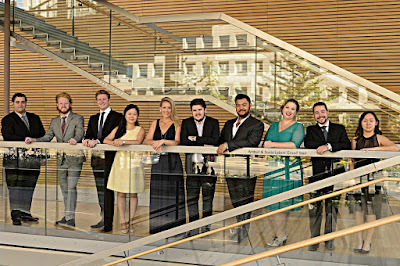 All eight singers this year are very fine singers with beautiful voices and solid training, and plenty of communicative power. And let's not forget the two collaborative pianists/coaches - they are the ones that make the singers look good! The Richard Bradshaw Amphitheatre was packed, and they were not disappointed. Tenor Charles Sy, one of the two new members of the Ensemble, kicked off the proceedings with Tamino's "Dies Bildnis." A graduate of U of T Opera Program, Sy has really blossomed into a very fine tenor, with solid technique and the requisite musicality. This afternoon, his voice rang out with a more robust timbre than I had remembered, large enough for the modern-day opera house, with plenty of warmth in his sound, evenly produced up and down the scale, totally secure and the aria executed with nice dynamic control, The Tamino aria is not an easy piece as so much of it sits in the passaggio, but he sang it beautifully. An excellent start to the concert! He was followed by bass-baritone Gordon Bintner, who has been a stellar member of the Ensemble the past two seasons. To me, Bintner is the complete package - wonderful voice used with elegance and taste, abundant musicality, cutting a handsome figure and commanding stage presence, with charisma to burn. I recall his excellent Alfonso two seasons ago. Once again he sang the Alfonso aria with rich tone and vivid acting. He mentioned to the audience he's going to sing the Count in the Ensemble Nozze di Figaro, The tessitura for the Count is high for a bass-baritone - it tells me the Bintner voice is moving up. The second new member of the Ensemble, St. John's Newfoundland tenor Aaron Sheppard offered Ottavio's Act One aria from Don Giovanni. The Sheppard voice is that of a fairly light tenor, with an attractive timbre. I believe he is only 23, still very early in his operatic journey despite having amassed an impressive CV. His "Dalla sua pace" showed off his nice mezza voce, important in this aria. If I were to quibble, his fortissimo notes, especially in the upper middle could occasionally sound flat, which I'm sure will be corrected during his time in the Ensemble under the capable guidance of voice teacher/former soprano Wendy Nielsen. Quebec soprano Karine Boucher offered Anna's lament, "Giusto ciel, in tal periglio" from a rare Rossini opera, Maometto secondo. I was lucky to have seen Joyce DiDonato sing this in Santa Fe Opera a few summers ago. This piece, though written for soprano, requires a strong middle, thus high mezzos like Bartoli and DiDonato have had great success with it. Boucher's warm lyric with its strong middle is lovely in this Bellini-like cantilena, sung here without the recitative. She delivered it with poise and pathos, the only thing one wished for was a bit more dynamic variation. French Canadian tenor Jean-Philippe Fortier-Lazure, who sang his calling card aria from Le Roi d'Ys so beautifully last year, showed off his versatility with a surprise - the quintessential English aria 'Where'er you Walk" from Semele. This aria requires good legato, long breath line and plangent tone. Fortier-Lazure's warm, soft-grained tenor aced this piece. Bass-baritone Iain MacNeil followed with Dr. Malatesta's "Bella siccome un angelo" from Don Pasquale. MacNeil was a fine Bartolo in the Ensemble performance of Barber last spring. His sturdy sound and lively stage presence was ideal in this aria - I can see him as a very fine buffo baritone in future seasons. 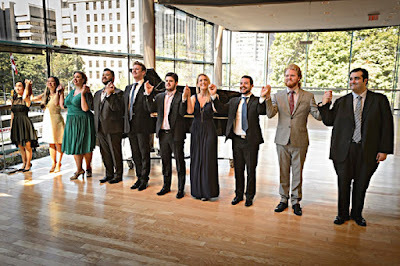 Of the four tenors, Andrew Haji has the highest profile and the most significant accomplishment - as the "triple crown winner" a year ago in 's-Hertogenbosch International Vocal Competition in Holland. More recently he was chosen to sing in a Teresa Stratas tribute in Athens. This fall, he is Alfredo in the alternate, all Canadian cast of La traviata currently in rehearsal. His gorgeous lyric tenor, ideal in Mozart and the lighter French and Italian repertoires, is sounding great. He sang Des Grieux's technically tricky "En fermant les yeux" with rich, refulgent tone, complete technical security, and convincing acting. I would say he's earmarked for a fine career. The final singer was soprano Aviva Fortunata, who has one of those comparatively rare soprano voices, a large, full lyric with spinto aspirations. She chose Elisabetta's "Tu che le vanita" - here sung in French as "Toi qui sus le neant" from Don Carlos. Fortunata's voice reminds me a bit of the former Ensemble soprano Joni Henson, who also sang Elisabetta on the mainstage in one performance replacing an indisposed Adrianne Pieczonka. Fortunata has a hall-filling, ringing soprano with plenty of squillo, but it's capable of nuance as well. This is a daunting aria that lasts almost eight minutes, and she gave a fine rendition. Fortunata for sure is a singer to watch. There you have it, eight singers, beautifully supported by the two Ensemble pianists - the excellent Jennifer Szeto and the very promising new addition Hyejin Kwon. With six of the eight singers with "high voices," they truly start the new season on a "high note"! I look forward to hearing more from them this season.